We are delighted to introduce our NEW!! cards and prints taken from original watercolours by Alison Erridge, Lucy’s mum! 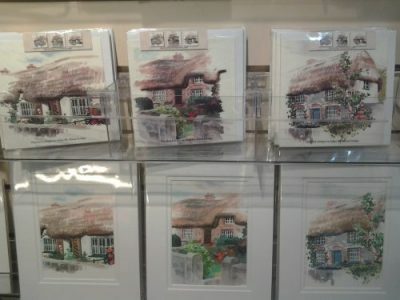 This range of cards and prints features some traditional thatched cottages in Adare which is an expansion of a range we have had in stock for several years and are very popular szoi8hk. The other series of cards in the new range depict the rolling landscape of East Clare in a more modern and contemporary design, also available as mounted prints, ready for framing, making them an ideal gift for any occasion. In addition to these new cards and prints, Alison has also created another selection from which to choose, depicting different scenes from Adare including Trinitarian Abbey, Thatched Cottages and Adare Manor, all available in laser cut greeting card or mounted image format. Along with these new cards and prints, many of Alison’s original pieces of art and textile work can be seen in the shop and are also available to purchase when an extra special gift is needed! The intricate detail on these pieces has to be seen in reality to be fully appreciated. We are currently working on bringing a whole new range of Alison’s artwork into other products which will be an exciting new selection for next season! To keep up to date with these new items, stay tuned and we will post a new blog later! !